Earn $1.66 in Rewards credit. Click to learn more. 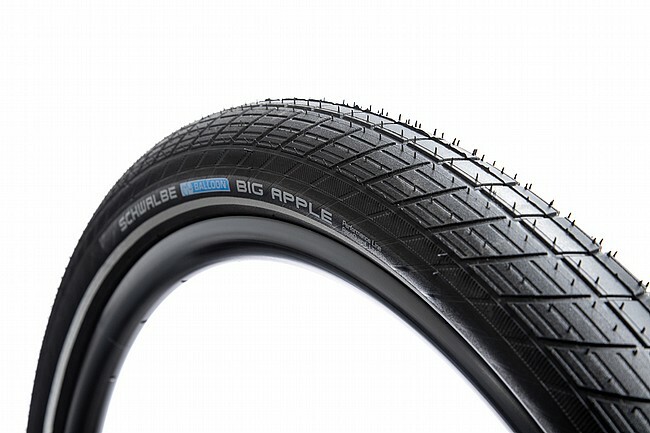 The Schwalbe Big Apple Plus 26" Tire provides comfortable cycling without using complicated technology. Bringing their Plus protection to this version, the tire adds 3 mm GreenGuard puncture protection for extra safety! Air cushion tires are used as natural suspension. Inflated to around 30 psi the Big Apple Plus rolls so easily and comfortably you'll be convinced you're riding on clouds. Your average 37mm-wide tire must be inflated to a rock-hard 55 psi in order to roll similarly well.